Bill Munter AKA Belt Buckle Bill is a good example how a small one man operation, working out of his house in Keating Summit can use the internet effectively to promote his business. Bill has sold his buckles all over United States and even got some queries from out of the country. Belt Buckle Bill sells high quality belt buckles and belt loops. He can even custom design one to your specks. His web page was design by Coudy.Com and can be found at http://www.beltbucklebill.com . 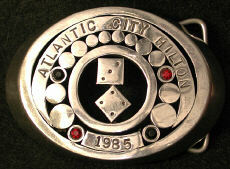 You can order these fine quality belt buckles on line at his web site. depending on what size monitor and what you have your screen resolutions set at. Congratulations on your success and for being our first Business of the Week.